Dr. Koh is fantastic. She was my obstetrician for my first pregnancy and delivered my baby girl. She was always happyto listen to, and answer, all of my questions. Dr. Koh is fantastic. She was my obstetrician for my first pregnancy and delivered my baby girl. She was always happy to listen to, and answer, all of my questions. She was nice and listened to everything I had to say without rushing me. Office was clean and everyone was veryprofessional and kind. She was nice and listened to everything I had to say without rushing me. Office was clean and everyone was very professional and kind. Dr. Audrey Koh promotes preventive health care and evidence-based medicine. Full OB-GYN care is provided, including minimally-invasive hysteroscopic and laparoscopic surgeries; infertility treatments; intra-uterine insemination; menopause management; pregnancy avoidance and terminations. Dr. Koh specializes in minimally-invasive surgery, ofttimes with major surgery performed through tiny incisions. 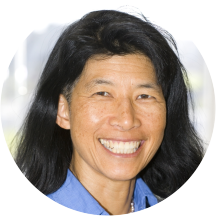 Dr. Koh is an Associate Clinical Professor in the Department of OB-GYN at U.C., San Francisco. She has received numerous Outstanding Teaching Awards, conducts research, and publishes actively in the medical literature. Audrey was fine, but the office staff at front reception not great. I called on the way to office and no one answered the phone. After waiting for 13 minutes was put on voice message. Tried calling three times. Need toknow about parking since I was new to office and to say I would be a few minutes late. When I got there and told her that she was cold and unresponsive. The nurse for Dr. Koh was very nice. I am familiar with Dr Koh from her previous office. Dr. Koh is informative and professional. She always listens to my concerns and addresses any issues with confidence. My experience with Dr. Koh was great! She was very welcoming, asked good questions, and explained everything as she was doing it. I would definitely recommend her! I've gone to Dr. Koh for years now. I always have a pleasant experience. Flawless. Dr. Koh is an amazing physician who cares about her patients. I can’t recommend her highly enough. Dr. Koh helped me bring my two babies to term so I have zero complaints about her. She just switched offices though and I had to wait 40 min for my appt, which is the longest I have ever had towait for her. The office could be more efficient in that regard. Dr. Koh was professional but not overly friendly or warm. She did not renew a prescription that needed to be filled urgently, even after I made several requests. Receptionists were quite rude. Dr. Koh was amazing! She came across warm and willing to listen to me explain my situation, but she also was extremely efficient at getting me in and out of there while addressing all my concerns. Highly recommend. It was good! She was very quick and professional. My appointment was at 8:30 and the office wasn’t open until 9ish, when I was seen. So that was a little disappointing. But I got out super quickly so that was fine in the end. Dr. Koh is wonderful and I highly recommend her. There is never any wait time, she is really helpful and explains everything so that it is easily understandable. Dr. Koh was very professional and caring. She walked me through all the details of my appointment. I wish she took our insurance. Dr. Koh was extremely helpful as she carefully listened to my concerns and offering multiple solutions. She was also super efficient and quick which was a plus since I was in a hurry myself. Great first visit. Would recommend. Dr.Koh was great! I went in for an IUD consultation and wasn't quite sure what I would ask but she was super patient and very informative. I really enjoyed meeting her and scheduled a followup! I had a good experience as a first-time patient. Dr. Koh was friendly, professional, and easy to talk to. She told me what to expect during the appointment, which helped ease my overall anxiety. The office staff were also very efficient! Dr. Koh and the entire staff were terrific! The doctor was empathetic and efficient. I liked Dr. Koh very much. She has a good sense of humor, and had a direct and friendly manner. My needs were simple: to have a pap smear and a breast exam. These were completed efficiently and comfortably. I hadsomething I needed to talk to her about, something that (to me) was slightly embarrassing. She was straightforward, recognizing my discomfort, and it was clear the only discomfort was mine. I would recommend Dr. Koh to any of my friends. Dr. Koh was very nice and approachable. Dr. Koh was knowledgeable and kind. It was a real pleasure being treated by her. I’ve been to Dr. Koh twice—the first time for a Pap smear and to discuss getting an IUD, the second time for the IUD insertion. Both times she has been very helpful and reassuring. At the end of the appointments shewould seem a little rushed, but not unkindly so (and I can understand being very busy!). Besides, if I had any more questions I could ask the nurses, who have been very nice and helpful as well. The IUD insertion was smooth, and Dr. Koh made sure I wasn’t in too much pain. She told me what was happening, and her voice and words made me feel comfortable and confident in the procedure. I’m very happy with my visits and will continue seeing her while I’m in SF! Terrible bedside manner. Refused to prescribe me birth control - b/c I had slightly high blood pressure. Put me on a different birth control without alerting me to the very different side effects that it has. And the receptionist - don'teven get me started. SO RUDE. Worst experience I've ever had with an OB/GYN - really just trying to bring me in to get multiple co-pays. Stay away. Quick, easy and she is very friendly! Overall great experience. Dr. Koh is very kind and really cares about her patients. She lets me know ahead of time what she will be performing. I've been seeing Dr. Koh for over 20 years and she is great! Had a great experience with Dr. Koh. The office was friendly and efficient, and she was warm and friendly. I felt at ease even though I usually dread these kind of appointments! Visiting an OB-GYN isn't my favorite activity in the world, but Dr. Koh made it a great experience. She is my favorite kind of doctor - very professional, great bedside manner, addressed my questions and concerns in a clear and actionablefashion, and was a lovely human being. Go see her! Visited Dr. Koh for my first pap smear ever and she was reassuring, attentive, and made the entire process quick and easy! It was my first time visiting Dr. Koh, and it was a pretty quick and easy experience. Since I was a new patient, they had sent me some paper work to fill out ahead of time (which ended up saving sometime). I arrived at my appointment, checked in, and didn't have to wait until I was led to see the doctor. Dr. Koh was very thorough and efficient, answered my questions, and tended to my needs without any issue. I was seen right away and Dr. Koh was very kind and efficient while helping me solve my medical problem. Highly recommend! Doctor Koh is very professional and know how to make me feel relax. The office is also very convienient with accessible LabCorp for my test. It's overall a good experience. Everyone was so friendly and great! Very fast and on time! You can't do better. Very kind, informative and professional. Dr. Koh is an incredibly sweet, timely and knowledgeable individual who will make you feel comfortable coming in, no matter the circumstances. I've always had a tough time finding doctors I like, and I would absolutely recommend her to anyone else. Dr. Koh was very kind, gentile and attentive. She listened and answered all of my questions along with concerns I had. She was to the point and efficient but I didn't feel rushed or confused. I felt comfortable and not judgedwhich is always a plus and I can tell that Dr. Koh truly knows her stuff and wants me to as well! The front desk/ assisting staff were all very friendly and helpful. I didn't have to wait long at all, probably 5 minutes. I needed some blood work done and the Lab Corp is on the same floor around the corner which was also very convenient. I am quite happy that I found Dr. Koh, I feel comfortable with her and really enjoyed my experience. I highly recommend her! I was visiting from out of town and thankfully zocdoc connected me to dr koh who fell in my insurance network - it was a successful visit, quick and efficient. Nothing unpleasant about it. Not great bedside manner when it came to dealing with a 20-something virgin. Not going back to her. You can tell she is so well educated on her subject and really cares about educating and helping her patients. I had a great first experience with Dr. Koh. The office staff was friendly, and though I had to wait for a short time before the doctor came into the room, a staff member came in to update me and offerwater. I really appreciated this small gesture. When Dr. Koh came in, she was friendly and easy to speak with. I appreciated that she seemed nonjudgemental and took her time to listen to all of my concerns and answer questions. My appointment was done within an hour of my scheduled time, which is what I typically expect for any routine visit. Overall, I was very satisfied with the experience and would definitely go back. This is a fantastic practice. I came 15 minutes early to fill out paperwork and the receptionist was very friendly. I was taken for my appointment right on time and barely waited in the room. My appointment was quick and Dr.Kohwas very friendly. I highly recommend especially because I live nearby.